Kazanluk has 54 021 inhabitants and is 350 m above sea level. It is a town located in the centre of the valley bearing the same name, whose eastern part is known beyond the boundaries of Bulgaria as the Valley of the Roses. It is about 200 km east of Sofia, 55 km east of Karlovo, 48 km south of Gabrovo, 75 km west of Sliven, 35 km north-west from Stara Za-gora and 108 km north-east of Plovdiv. Kazanluk is an important industrial, historical and cultural centre. The town is the capital of the Roses (rose growing) in our country. The first settlement on the territory of today?s Kazanluk was founded in Neolithic times. During the Eneolith and the Bronze Age life in the settlement went on. It was during the 5th-4th centuries BC that the Thracian town Sevtopolis, bearing the name of the Thracian King Sevt III ( now the ancient settlement is under the waters of the Koprinka Dam, 7 km. to the west of the town) was announced capital of the Thracian state of the Odrissi (a rich civilisation of the Tonzos valley - today?s Toundzha River). From those days are more than 12 burial tombs already found, the most important of which is, by no doubt, the Kazanluk tomb offering a unique insight into the life of the ancient Thracians. Today?s town of Kazanluk was established at the beginning of the 15th century. By the end of the 19th century Kazanluk had become well-known for its production of rose oil, copper plates and household articles, abi (coarse homespun wollen cloth and upper men?s garment made of it) gaitani (braids). Due to the loss of markets throughout the Ottoman Empire after the Liberation the crafts declined to give way to contemporary economic activities. Kazanluk is an important transport centre. It is cut across by major motorway Sofia-Karlovo-Burgas and the respective railway line but also by main motorway from Rousse through Veliko Turnovo and Gabrovo in the direction of Stara Zagora, Plovdiv, and Haskovo. There are regular bus routes connecting the town with Gabrovo, Stara Zagora, Karlovo, Plovdiv, Lovech, etc. 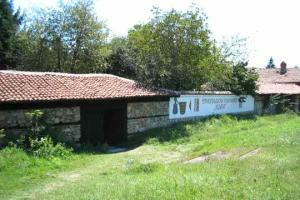 The Kazanluk Thracian Tomb (dated back to the end of 4th and first half of the 3rd century BC) was excavated in 1944. It is one of the 9 cultural, historic and natural sites in Bulgaria included in the UNESCO list of monuments of global importance. Indeed, it is a masterpiece of the Thracian architecture and painting. It is considered to belong to the ?dome-shaped? type of tombs. The tomb is located in the north-eastern parts of the town, in the Tyulbeto Park. It consists of a lobby, a corridor and a round-shaped dome-roofed burial tomb. The system of ornaments in the corridor is complex and extremely interesting. The walls are covered with shining, fine plaster and a beautiful fresco - characteristic of the times - of interwoven leaves encircle its upper part. Scenes of war are depicted and in the centre of each one can see two warriors and two more coming from both sides, all of them in their battle attire and weapons. Warriors on horseback are also shown with the particulars of their battle gear and armament. This theme relates to the military and political activities of the deceased. The focal point is the main composition, which describes a burial feast. It is there that one can see a married couple of obvious eminence, painted with great skill and care. They are placed sit but next to them stands a tall woman, presumed to represent the Goddess of land and fertility - Demetra. Numerous figures of wildly galloping horses and battle carts add to the width and depth of the scene. The tomb is embedded into a special protective building, equipped with all the necessary air-conditioning systems for preserving the frescos. Another notable tomb is the Muglizh Tomb - 3 kilometres west of the small town of Muglizh (regular busses from Kazanluk). It dates back to the 3rd century BC and has an overall length of 23 meters. Iskra Town Museum was founded in 1901, exhibits more than 70 000 objects and is one of the oldest in the country. In 1930 director of the museum became the well-known Bulgarian writer Dimitur Hristov Chorbadzhiiski - Choudomir. At present it is divided into 5 thematic sections. The Town Art Gallery is one of the oldest and richest in the country especially when one takes into account that Kazanluk is the birthplace of such painters as Dechko Uzunov, Nenko Balkanski, Ivan Milev, Choudomir and a number of others. Apart from great pieces of art, the gallery possesses a collection of icons and engravings form the Revival Period as well as a small collection of works from the sphere of the ornamental and applied arts. Branches to the gallery are the houses of Prof. Nenko Balkanski, and of the national painter Dechko Uzunov both exhibiting unique pieces of art. The Museum of the Rose. The oil-yielding rose was imported in Bulgaria during the 18th century from the Middle East and found the most favourable conditions for growing in the valley of the Toundzha River - between the Stara Planina and the Sredna gora mountain ranges ? the valley was later called ?Valley of Roses?. Founded in 1969, this museum is unique of its kind not only in Bulgaria. Each year during the first weekend of June it becomes the focus of attention during the traditional annual Festival of the Rose - the most colourful event in the Town of the Roses. Koulata Ethnographic Complex (the Tower) is located in the oldest quarter of Kazanluk at Knyaz Sve-to-poli-Mirski Str. Two restored houses were turned into permanent ethnographic expositions - a traditional village house of the sub-Balkan region as from the 19th century and a typical town house (the Hadzhienov?s house) of mid 19th century illustrate with their interior the way old Bulgarians lived in this part of the country. St. Joan the Precursor Church was built in 1844. In 1877 the greater part of the frescoes were destroyed. Stefan Ivanov, Nikola Marinov and Dechko Uzunov restored the wall paintings in 1936. Now it exibits two medallions, painted by Choudomir and Mara Chorbadzhiiska as well. The Holy Trinity Church - 1834. 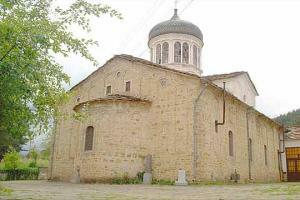 St. Iliya the Prophet Church of 1866. In 1877 the bashibozouk (armed volunteers) of the army of Sulleiman Pasha slaughtered more than 200 citizens of Kazanluk, seeking refuge in the church. Their bones are exhibited in the church-yard. The Nunnery Convent (1828) was a hospital for Russian soldiers and Bulgarian volunteers during the Russian-Turkish War of Liberation of 1877 - 1978, many of which were buried in its backyard. Shipka-Bouzludzha National Park-Museum was founded in 1956. It includes the Birth of Christ Memorial Church (the Sipka Monastery) nearby the town of Shipka (12 km north of Kazanluk, regular bus line), The Memorial of Freedom on Mt. Shipka (above the Shipka Pass through the Balkan Mountain, 26 km. north-west of Kazanluk, all Kazanluk-Gabrovo busses stop there), and the historical sites nearby - the Monument of Victory and the adjacent park close to the village of Sheinovo (11 km north-west of the town and 3 km south of the town of Shipka, regular bus lines) and the historical places at Mt. Buzlu-dzha (17 km north of the town and 12 km to the east of Shipka Pass, no regular bus lines) in the Balkan Mountain. In the surroundings of the town of Shipka, on the southern slopes of the Balkan, Bulgarians have built the Birth of Christ Memorial Church in honour to the heroes of the Russian-Turkish War of Liberation of 1877-1878 - Russian soldiers and Bulgarian volunteers. Its gold plated domes and beautifully ornamented facade stand out against the mountain and attract the attention of all heading for the Shipka Pass. Sanctified on 27 September 1902, the memorial church is built in the Russian clerical architectural style of the 17th century with an entrance under 3 arcs, over which there is a high and impressive belfry. The names of the Russian regiments and the soldiers who gave their life for the liberation of the country are engraved on 34 marble plates. In the church one can enjoy Slavic spiritual music and see the permanent exhibit of icons and church plate. The Memorial of Freedom stands proud on Mt. Stoletov (1326 metres) to the south of the Shipka Pass in the Balkan Mountain. A stairway of 894 steps gets visitors from the pass to the memorial, built in 1934 with the voluntary support of the whole nation. It is 31.5 meters high and over its main entrance one can see the proud figure of a bronze lion. The other three sides of this entrance bear the inscribed the names of Shipka, Sheinovo and Stara Zagora - the battle fields reminding us of the heroes of war and the feats of Bulgarian volunteers. 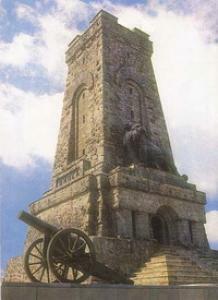 The Memorial of Freedom is amidst Shipka National Park-Museum. Indeed, few are the museums situated in the very real theatre of battles and Shipka is one of them. It includes all the places and points of interest related to the defence of Shipka Pass and is a complex of memorials, remakes of strategic positions once held, trenches and batteries. The historical, and most noted, rocky cliff ? Mt. Orlovo Gnezdo - is nearby. It became the arena of the decisive and dramatic battle for the pass from 21st to 23rd August 1877 , which later inspired the national poet Ivan Vazov to write the immortal poem ?Opalchenzite na Shipka? (The Defenders of Shipka) Each year on 3rd March (Bulgarian National Holiday) and on 23rd August (the most dramatic day of the battles and of the whole Russian-Turkish War) national festivities are held. As a result, a whole tourist settlement has emerged through the years. The feat of Russian and Bulgarians during the Russian-Turkish War of Liberation has been honoured by yet another monument ? the memorial at the village of Sheinovo. It is built exactly on the spot, where the spontaneous parade of victory was held on 28th December 1877 to mark raising of the white flag by Veissel Pasha and the surrender of his army of 30 000. It is in the form of a sword 15.6 meters high - blade up. The memorial bears engraved the names of all Russian and Bulgarian participants in the battles and texts of gratitude as well. Under the historic Mt. Buzludzha in the Balkan, stands the memorial of Hadzhi Dimitur and his volunteers, erected on a small meadow on the northern slope of the peak, where all found their death on 2nd August 1868. It is a sculpture of the leader at the head of a wall of 28 stone blocks, bearing the names of the dead warriors. There is a whole tourist settlement, including two chalets with the same name - Bouzloudzha. Other points of interest around the town of Kazanluk include St. Paraskeva Church in the village of Enina (4 km north of the town, regular buss line) built during the reign Tsar Assen II ? about 1237-1238 and considered the oldest in the district. Several times partially burnt and recovered it owes its notoriety to the manuscripts found therein. St. Nicolai Monastery is close to the town of Muglizh (15 km east of Kazanluk and 2.5 km north of its centre, regular bus lines). 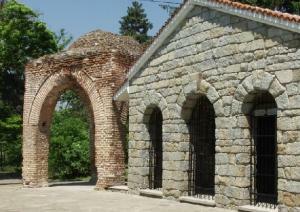 It is beautifully situated on the bank of Muglizh River and represents an immortal bastion of Bulgarian spirit. The Koprinka Dam is only 6-7 km to the west of the town. There are recreational and tourist facilities built around it - a wonderful place for leisure and sports out in the open air. It is easily accessible by regular bus lines from the town. Kazanluk Mineral Baths (Ovoshtnik) are located 5 km to the east of the town and 2 km south of Ovoshtnik in the immediate vicinity of the Toundzha River. There one will find an open mineral beach. Some of the villages adjacent to the town of Kazanluk are departure points of several marked tourist tracks crossing the Shipka Balkan (refer to the Stara Planina related chapter herein).